A vacation is a welcome break for most people. After working hard for several months, getting some time off to engage in personal activities is a real treat. Traveling is usually top on the agenda for many people. However, it isn’t always possible to engage in travel. Finances may be restrictive or plans may simply not be feasible. The good news is you don’t have to travel or go away from home to enjoy your vacation. Sometimes, just being at home can give you the best vacation you thought possible. A staycation is a vacation where you spend time at home, engaging in various activities in and around your home. cooking techniques. Whether you choose to improve on your baking or gourmet food preparation techniques, a staycation is a great way to update your culinary skills. You may want to have family cook nights more often during the week. When everybody gets involved in meal preparation, it provides a great opportunity to bond. Family members also find meals more enjoyable when they participate in preparation. Make plans to visit a farmer’s market as a family so that everybody has a chance to pick some fresh produce, for cooking later at home. Events Most neighborhoods have local events that take place throughout the year. This includes car shows, circus activities, festivals, music concerts, sporting events and other interesting activities. By doing an online search or perusing the local newspapers, you can get to know what’s happening in your area. Draw up a list of events that sound interesting and make plans to attend. 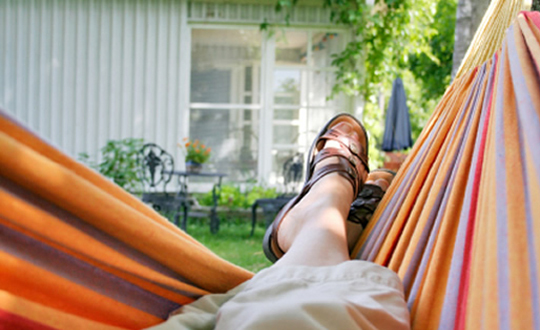 This can help to keep you well engaged during your staycation. Outdoor maintenance Spending some time in the yard can be a fun and therapeutic experience. You can rake up leaves, make minor repairs, build a shed, do some weeding or pruning, or engage in just about any activity that will improve the look of your home. Be sure to take some time to relax in the yard once you’ve put things in order. Whether you’re reading, walking or simply sitting outside, a breath of fresh air is always welcome. Home improvement For many people, getting the time to attend to small jobs at home is a challenge. This creates a list of pending jobs that can appear overwhelming. However, these jobs can easily be attended to when sufficient time is available, such as during a staycation. Draw up a list of projects that you need to work on while at home. Engaging in do-it-yourself activities in the home is a great way to make your time at home worthwhile. Plus, nothing beats the satisfaction of seeing what you were able to fix, usually with just a bit of effort. Local Sites Perhaps you’ve never really taken the time to explore places close to home. Quite likely, many of these sites are just a couple of hours or less away from your home. You can draw up a list of animal sanctuaries, botanical gardens, historical features, museums, sporting facilities, and other sites of interest to explore during day trips. Getting to know first-hand what your region has to offer is a fun experience. Movies Watching movies is a great way to relax while lounging at home. Draw up a list of interesting movies that you’ll enjoy watching. Spice up things by making lots of popcorn or getting delicious snacks to indulge in as you watch. Outdoor activities Enjoying a leisurely stroll through the neighborhood can be great fun. It gives you an opportunity to observe what there is around you and simply connect with your neighborhood. If you have parks and camping sites in the vicinity, you may want to take a hike, go on a picnic or engage in camping activities. A staycation is a cost-effective alternative to the traditional vacation, which is generally characterized by travel. Staycations have many benefits, which include curbing over-expenditure, allowing you to save money. This helps to promote personal financial management and encourages greater application of basic accounting principles in your finances. You are bound to have a more positive living experience when finances are firmly under your control. Staycations have achieved morepopularity in recent years as the recession takes it toll on an increasing number of people. With more individuals out of work and many of the employed feeling insecure about their jobs, staycations have become the practical alternative to the traditional vacation.